Justin Mogck with Vern Frey, sale consultant. 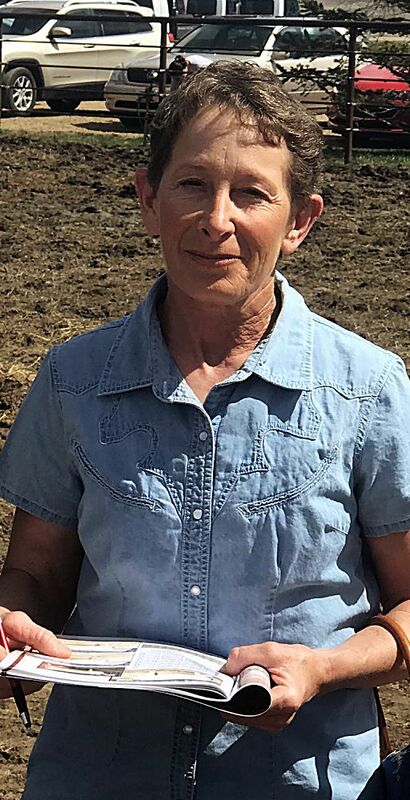 Location: At the farm, Tripp, S.D. 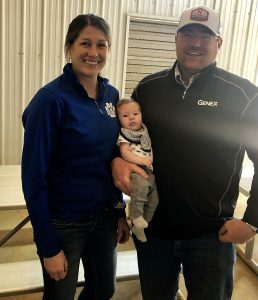 Mogck Angus Farms, operated by David and Justin Mogck and their families, hosted a huge crowd for their annual bull sale held at their farm, right on the edge of Tripp, S. Dak. 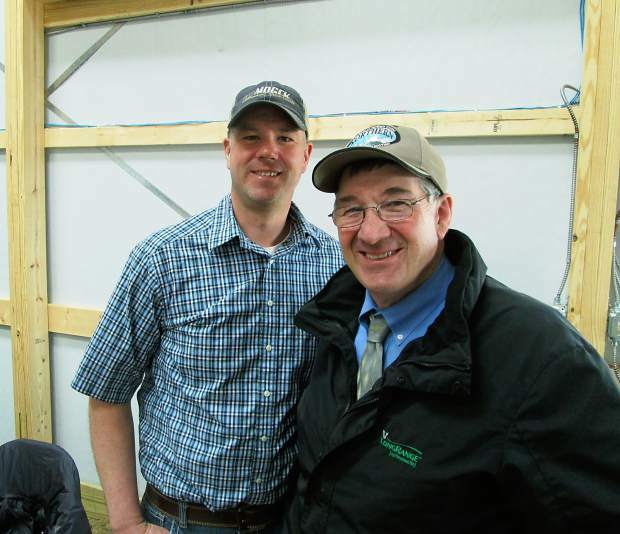 This was the first time the sale was held at home, and it was in a brand new sale barn. The Mogck farmstead is one of the more beautiful settings you will see in South Dakota. The bulls were all penned on fresh grass, and this made for an outstanding presentation. During the actual sale, videos of each animal were displayed on three large screens. The bulls did not walk through the ring, but there was plenty of time to walk through the bulls prior to the sale to evaluate each one. The top end of the Mogck bulls generated big competition, with lots of breeder interest. There were many repeat buyers on the seats, and they quickly bought this progressive set of bulls. 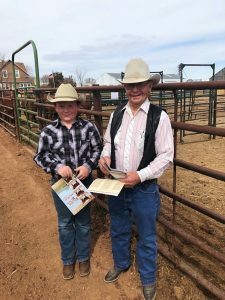 This made for the best sale ever for this Angus family. The top selling bull of the day was Lot 48, MAF In Focus 423, selling for $25,000 to Accelerated Genetics from Baraboo, Wisc. He was a son of Connealy In Focus 4925 and out of a daughter of Sitz Upward 307R. Born at 77 pounds, he weaned at 789 pounds and reached 1426 pounds as a yearling. His EPDs were CED 8, BW 0.2, WW 69, YW 120, SC 1.04, MILK 30 and $B 130.40. He had outstanding 50K numbers for weaning and yearling. Demand was also evident on Lot 63, MAF Hobart 441, as he sold for $20,000, and the winner this time was Rob Vanhove, Madison, S. Dak. This son of Duff Hobart 8302 was from a dam by LaGrand MAF Antidote 5775. This member of the Denver Pen had an outstanding physical profile, complemented by EPDs of BW 2.8, WW 54, YW 92, SC 0.69 and MILK 21. 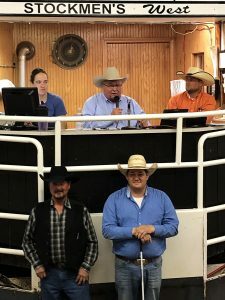 MJT Cattle Company, Alberta, Canada, purchased Lot 51 at $16,500. Here was a son of Dameron First Impression who was out of a daughter of LaGrand MAF Antidote 5775, and had produced the heaviest weaning weight calf in this year’s sale. This young bull (4/16/14) was in their Denver Pen. His EPDs included CED 8, BW 1.4, WW 55, YW 93, SC 0.45, and MILK 30. He weaned at 888 pounds and had a 37 cm. scrotal measurement. Anderson Cattle and Maxwell Colony, Parkston, S. Dak., teamed up to buy Lot 11 at $16,500. He was a son of Connealy Confidence 0100 and out of a daughter of B/R New Frontier 095. This calving ease bull was only 70 pounds at birth. His EPDs were CED 17, BW -2.5, WW 44, YW 90, and MILK 24. He weaned at 704 pounds and posted a yearling weight of 1306 pounds. Lot 47 sold for $14,500 to Allen Schoenwold, Marion, S. Dak. He was a son of Connealy In Focus and out of a daughter of GAR Solution. His EPDs were CED 12, BW -1.3, WW 64, YW 113, MILK 25, and $B 121.92. Born at 77 pounds, he weaned at 753 pounds and grew to a yearling weight of 1385 pounds. He scanned a 17.2 sq. in. rib eye. The Mogcks have been in the Angus business for 82 years, improving their genetic pool each year. Give them a call. 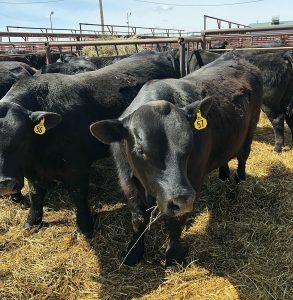 They work hard to develop cattle that will fit in the cattle herds for their customers.